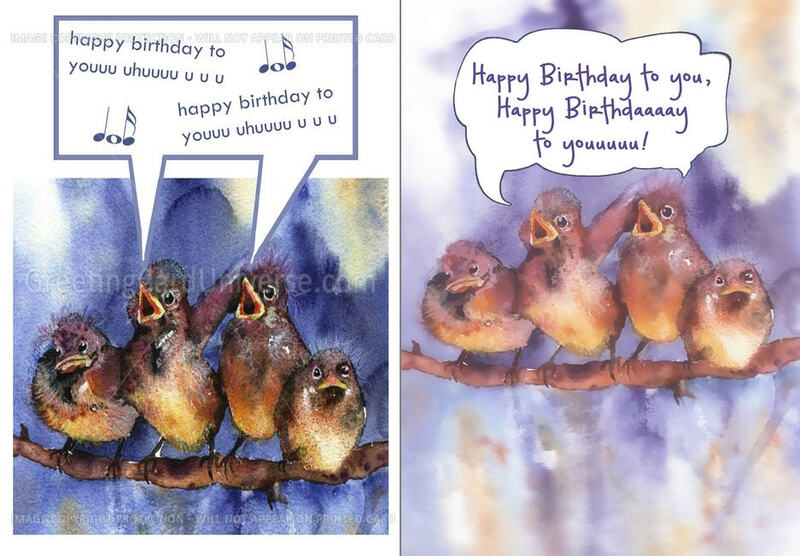 Recently, GCU artist Barbara Schreiber had a collection of older cards Returned for Edits because of many technical issues. She took the notification as an opportunity to update and refresh a design whose flaws were obvious now that she had more experience as a card designer. Read what Barbara has to say below. Nobody likes getting those “returned for edit” emails, but I would like to encourage artists who receive those emails to see it as a real opportunity to improve on their designs. I get them also. My background as a watercolor painting teacher helps me to see things positively. I used to correct my students, and without my correction and pointing out flaws, they would not improve and become better. So having that in mind, I think “ok, here comes an opportunity to improve my design” when I get one of those emails. For example the latest batch of emails I received concerning the sparrow design you see here. These cards got returned for several reasons: elements too near the border, speech bubble too near the border, too dark lighting and other flaws. I made these cards quite some time ago, when I did not use the template and did not have the technical know-how and software I have today. I tackled the issues that were mentioned and while I was at it, improved other flaws that today, having more experience, I could see more clearly. The results: the cards with the baby and the hand sell quite well (another card series I updated recently), and I hope that the improved sparrows will do the same. The improved cards are worth the extra effort I put into them. They sell better. And I guess that’s something all of us want. The “before” card is on the left, the “after” card on the right. Thanks Barbara, for sharing your experience with such a good example. Your watercolor paintings are delightful. Although I was not an art teacher, my background as an art student also helped me to be more open and positive about corrections and critiques. It has always amazed me that a little change here or there can make such a big difference. I think … why didn’t I see that? I have a question for Corrie (or anyone in the know) about updating older cards that were not “returned for edits.” I’ve been working on updating some of my older cards and wondered if I can just replace the old image with the new one without contacting the review team. The image is basically the same but I have improved image and sometimes changed fonts. In an effort to not add extra work time for the review team I was planning to just replace the old images. However, I keep wondering if they should be contacted. At this time you can update the images as you see fit. There is a little exposure here but not enough to start from scratch assuming it’s a minor modification (like Barbara’s example). If you’d like the review team to give your updates a once over (all of them or even just 1 sample being applied to a collection) simply drop them an email with the pid# of the updated card and they’ll happily weigh in. Or ask them to return 1 or more to you for edits. If it’s a major modification, not just an improvement on the existing image then you should submit one sample to the review team (feel free to fast track this) and explain in the Notes to Reviewers what your plan is and what pid#s will be impacted. This card can be used truly as a concept sample and Declined with notes from the review team saying something like “image approved for you to proceed with existing cards”. Thanks for taking the time and interest in updating your older cards! Sure appreciate you taking the time to reply here on the GCU blog. Glad to know we can update minor changes on our own and that it’s okay to contact reviewers if I feel the need or make major changes. I’ve had nothing but positive experiences with the GCU review team. Would just like to mention that I have run some of my updated images through the critique clinic here and have received very constructive and useful input. The GCU Community Blog is truly an asset to the artist community. I read every post and continue to learn and gain a world of useful information and resources that are shared here. I’m very grateful to Barbara, Corrie, Doreen and all the others who take the time and effort to share their expertise, knowledge and experiences. As my Grandson would say …. It’s totally awesome! This comment from Barbara leads me to look for another before & after image set …is it missing from the post? Thank you Mindy, yes, I was pretty sure there was another post here saying as long as the adjustments are minor, so that is what I’ve been doing. I’ve had a lot of cards returned for edits, and once I do, I can see the difference between Marketable vs Unmarketable. Love the bird card!